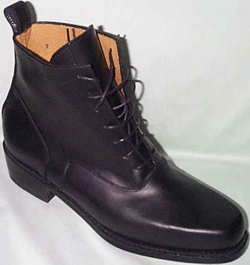 For Victorian Men's Boots and Shoes click here. Ladies Victorian, Edwardian and American Civil War Boots and Shoes including: High Button, High Top Lace Up, Gusseted and Buckle shoes. Some have the low heel used prior to 1867, others have the slightly higher heel of 1867 on and some have the high heels of the 1890s and on. 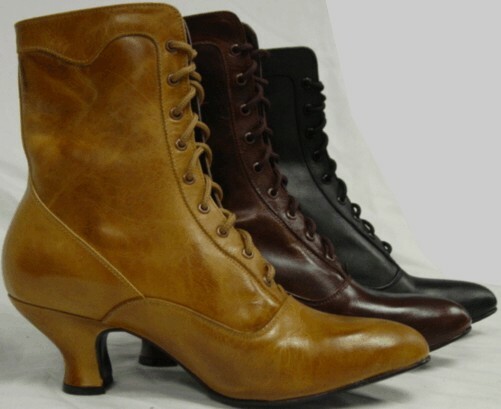 We also have some shoes that are NOT reproduction, but have the style of the period shoes for those interested in the style, but not necessarily wanting reproduction shoes / boots. We carry work shoes, everyday shoes and dress shoes. Some of these shoes have been popular for weddings. 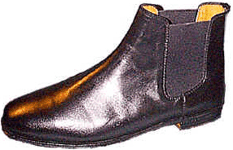 Some of the shoes and, such as the some of the Oak Tree Farms, are NOT reproduction. 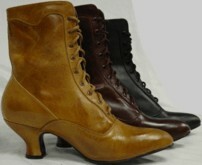 They are what could be call retro, as they are modern made shoes that look like those of the earlier period. In most cases the differenced is minor. 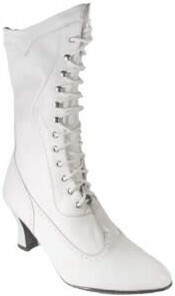 These are the ladies high top shoes, with 7 holes on each side for laces. It is well-suited to the horsewoman seated sidesaddle, traveling by coach or attending a Civil War Event. They do not have metal eyelets (which were Patented in the 1890's) nor toe caps (stitching near the toe). 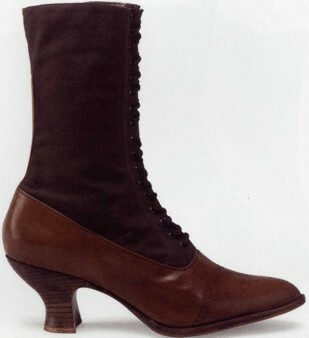 They have leather heels (Rubber heels were Patented by in 1889 by Humphrey O'Sullivan, a printer with tired feet). The Stella has a softly pointed toe, which is correct for Civil War (although the square toe is more typical for Civil War) and also later usage. They are made from dark smooth-grained leather and are fully lined with leather. 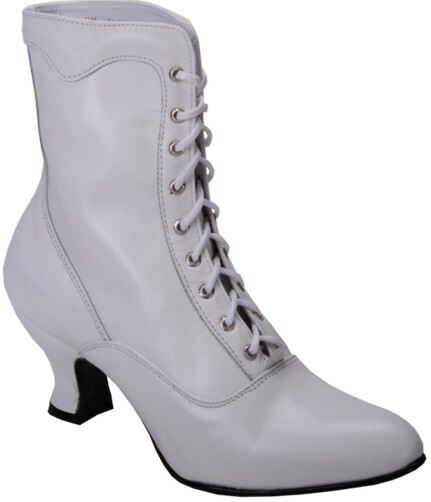 They are built on a modern last for your comfort, with leather heel and come with round leather laces. This is a first quality shoe. Standard colors: Black, sizes 6 to 11 1/2Medium. 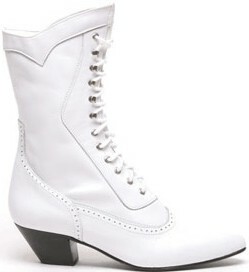 These are the ladies high top shoes, with 6 buttons and false button holes (Buttons are for looks only). They are actually a pull-on shoe with an elastic gusset (patent 1837 - same as used in the 1847 Mexican war U.S. booties). This is a flat heeled ankle high shoe. 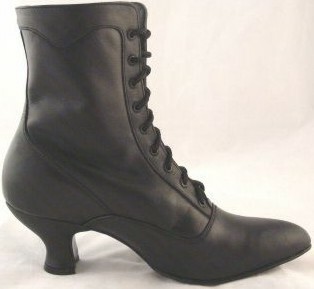 This is a lovely Civil War and Victorian era reproduction shoe in black or Bone (Cream) leather. Standard colors (Black or Bone) and sizes (6 - 11, Medium & Wide). The sleek companion to the Victoria is the rose. 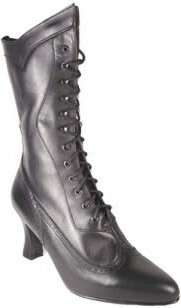 With two elastic gussets (patent 1837 - same as used in the 1847 Mexican war U.S. booties) it give more room for ladies with a high instep or heavier ankles. It is correct for Civil War and also later usage. 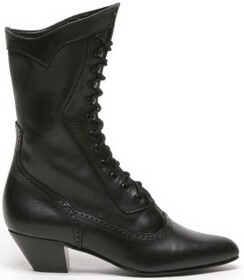 It has a plain, tapered square-ish toe and a vamp much like fine English riding boots or jodhpur. Designed to be comfortable for outdoor wear, it is a fine shoe for the active lady, whether period-correct event watcher, nurse or sweetheart. The Rose is leather lined and very well constructed. Standard colors: Black, sizes 6 Medium to 11 Wide. 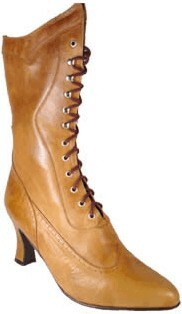 This is the exact same shoe as the men's dress brogan, but converted to ladies shoe sizes. Available in Black smooth top grain or rough flesh-out leather. These brogans / work have four lace holes and shoes Sewn Soles. They are suitable for women's work wear. Because of a glitch in naming the widths of our very first Bootees, our E width is more like a standard D. This page is in ladies shoe sizes. These ship from Florida. Normal delivery time is 5 to 10 days. "Large/Small Sizes" or if your size is out of stock can take 2 to 6 weeks. This is the same shoe as offered on the Men's Shoe page, but converted to ladies shoe sizes. The Southern or Monticello model. It is appropriate for Seminole Wars and as a work shoe from the early 1800's until the present day, it is built on the same lasts as the Federal Contract Bootee. It has five lace holes and a pull tab on the back of the boot. It's color is russet or natural and the rough-out model takes on a beautiful color when given a coat of Lexol or other oil. Smooth or rough. Sewn-On Soles. This page is in ladies shoe sizes. 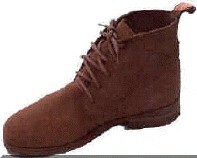 Hi-Top lace-up leather shoe for Ladies with canvas upper. 2 1/2" Stacked leather heel and sole. Heel has a metal plate above the bottom layer of the heel to keep you from wearing into the heel stack. NOT for anyone with a wide foot, as this shoe is just wide enough for a medium width. 1890s on. 1890s on. Hi-Top lace-up shoes for Ladies. More description coming soon. Available in Black and Conac in Kidskin Leather. Antique Saddle Leather and 1 pair of size 9 Brandy Leather. 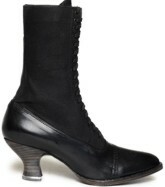 This boot/shoe has a more modern High heel and extra pieces sewn on for looks. It is NOT a reproduction of an 1800s or early 1900s boot/shoe, but they are a nice looking shoe for someone who just likes the look. 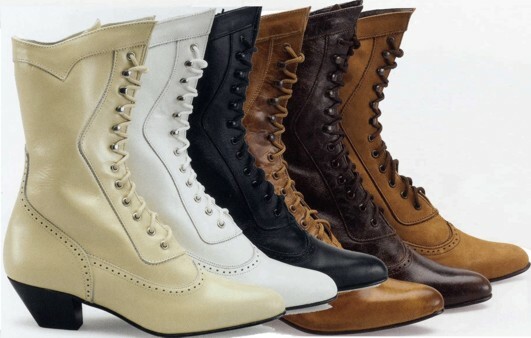 Hi-Top lace-up shoes for Ladies. Discontinued. I currently have in stock 1 pair each of what ia shown on the shopping cart. 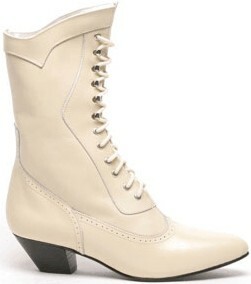 This boot/shoe has a modern cowboy heel and extra pieces sewn on for looks. It is NOT a reproduction of an 1800s or early 1900s boot/shoe, but they are a nice looking shoe for someone who just likes the look. 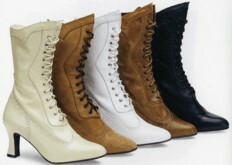 Hi-Top lace-up shoes for Ladies. Available in Black, White, Ivory.